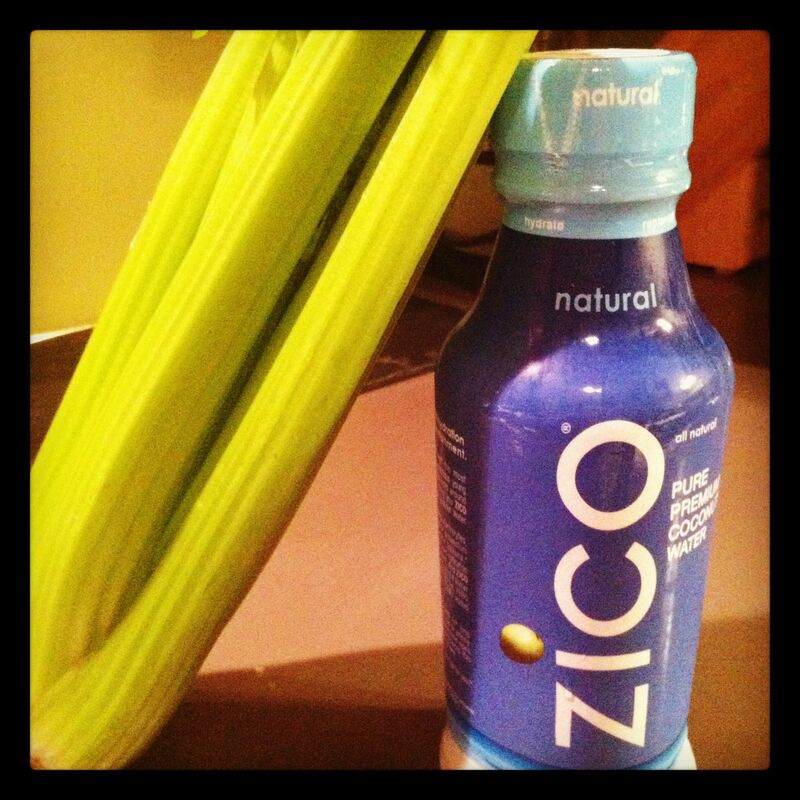 Sometimes you need a nice, green smoothie to detox. 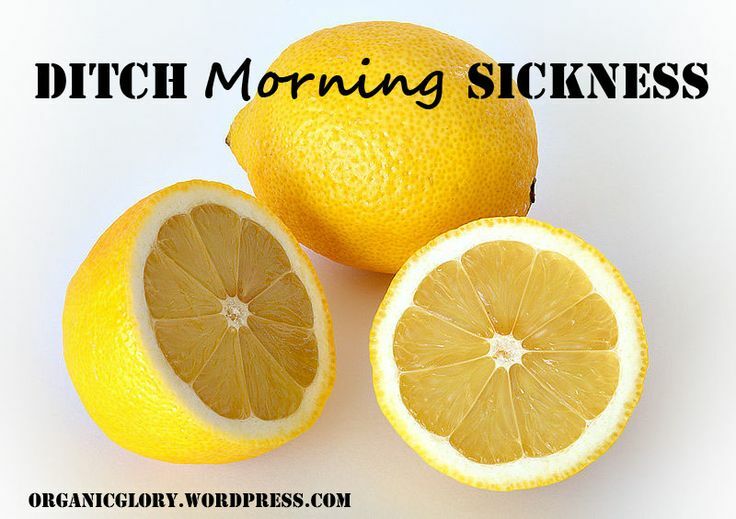 Especially if, like me, you have some health-related diet restrictions that mean every now and then you have to purge all the junk food from your life to get yourself back in order. That means no McDonald’s drive-thru between errands (I’m looking at YOU, husband! ), no takeout pizza, no late-night Girl Scout cookies, and no fistfuls of snickers from the candy dish at work. 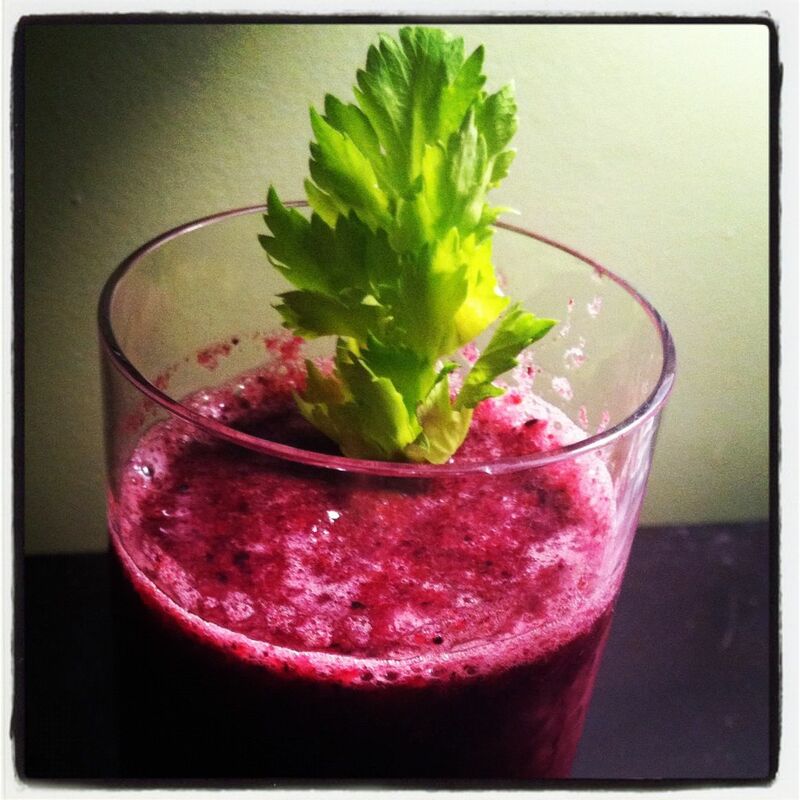 This recipe comes to us from The Wishful Chef, which is one of my top go-to sites for green smoothies, simple, fresh recipes, and gorgeous photos. 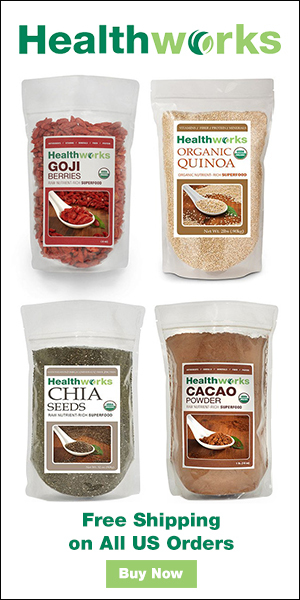 Blend all ingredients together and process until smooth, taking care to put the water in first so your blender doesn’t jam. 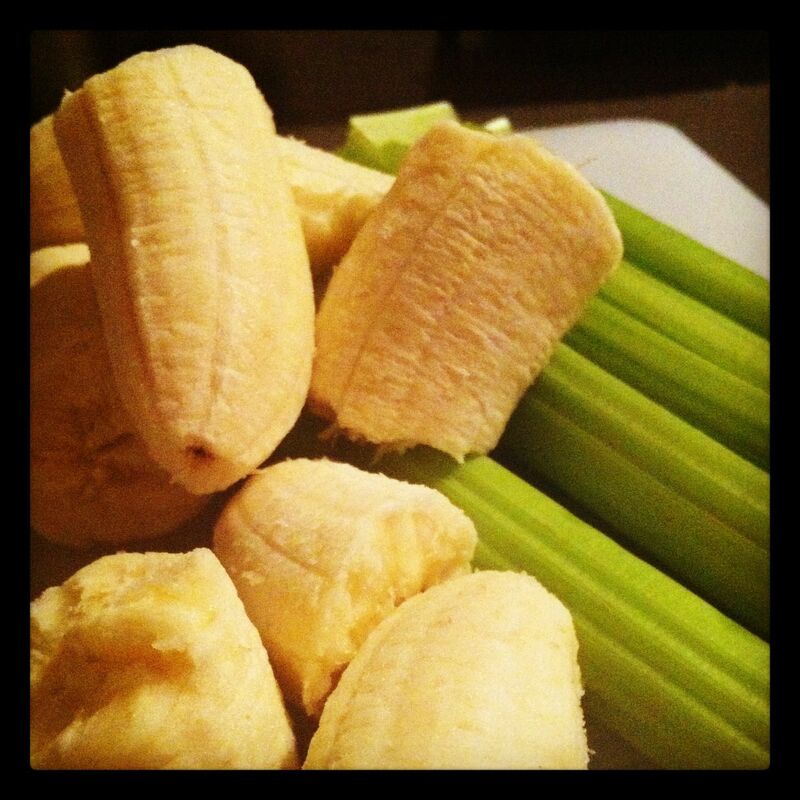 Celery is a staple in my smoothies. It adds a light, fresh flavor, and best of all it has countless health benefits — it’s an excellent source of Vitamin C, Vitamin K, and potassium, and on top of that it’s fiber-rich and may help lower cholesterol. 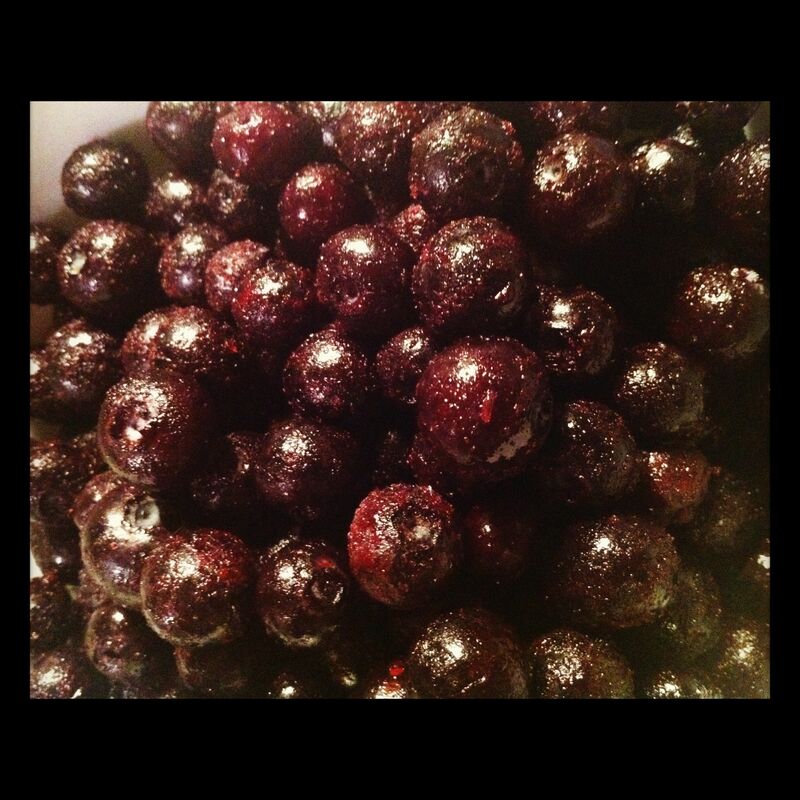 This recipe will make enough for roughly two smoothies; put them in a pitcher in your fridge, and enjoy for breakfast in the morning! 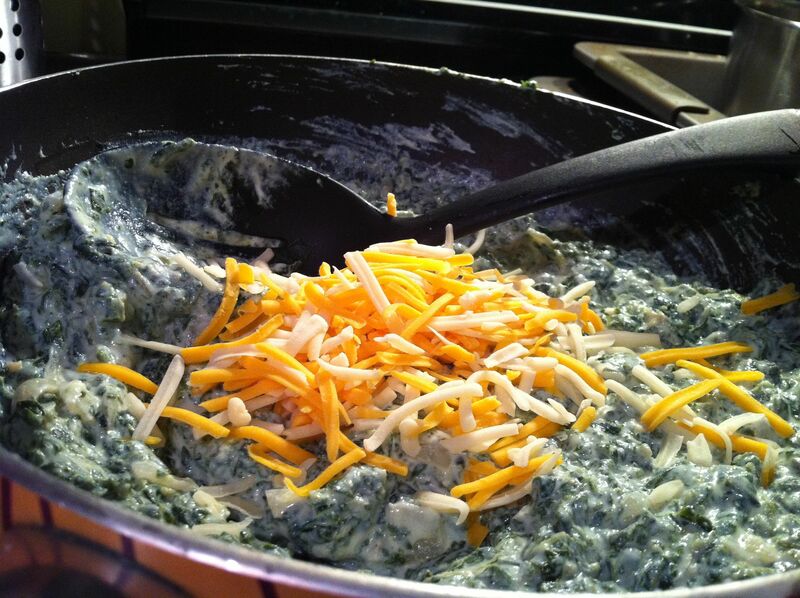 Who doesn’t love spinach & artichoke dip? This recipe combines everyone’s favorite appetizer with comfort-food favorite mac n’ cheese, with delicious results. 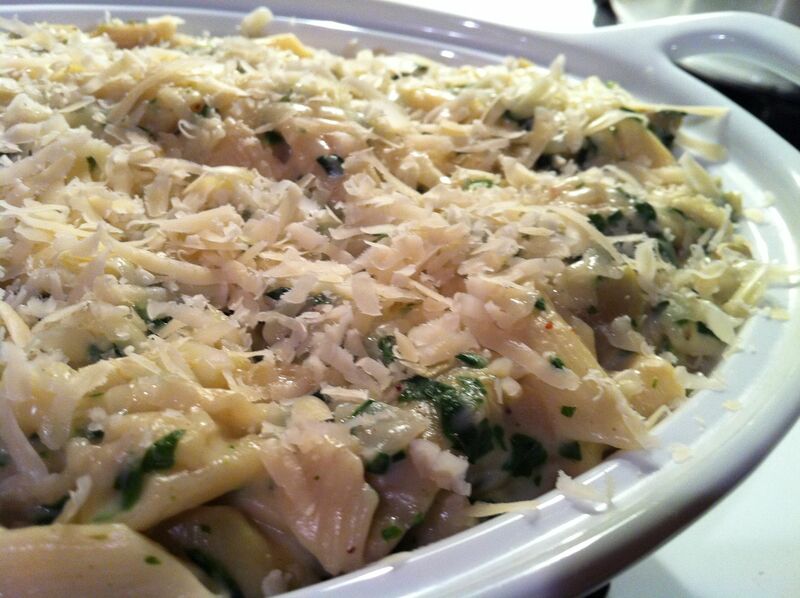 This recipe is a Rachael Ray classic that I follow to the letter. No need to change a thing about it. Preheat the oven to 375 and set the pasta water on to boil. The recipe from Rachael Ray calls for salting the water, which I don’t typically do; here, though, the bland white sauce could overwhelm unsalted pasta, so I would lean toward salting the water. 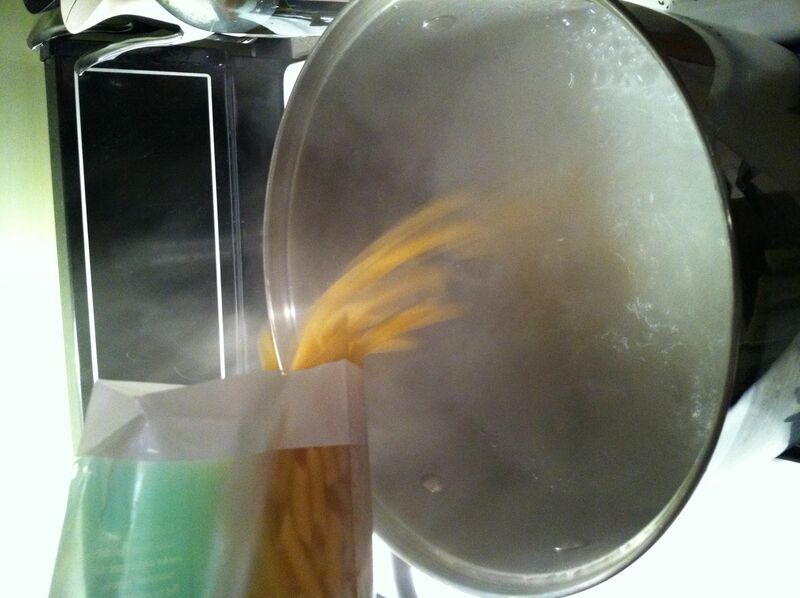 If you do this, add it when the water is at a rolling boil just before you add the pasta, otherwise it will sit in the bottom of your pan and possibly corrode the pot before dissolving. The most important thing with the pasta for mac n’ cheese is to undercook it a bit; if you cook it fully or (like I once did) overcook it, the penne will turn to mush when you bake it. While the pasta is boiling, prepare the other ingredients so they’re ready to go. 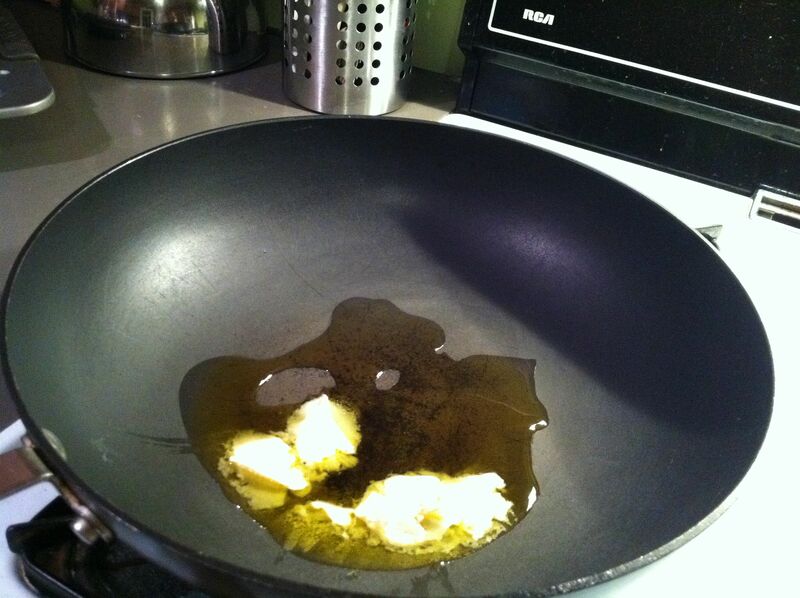 Place a medium pan over medium-low heat and swirl with olive oil and butter until melted. 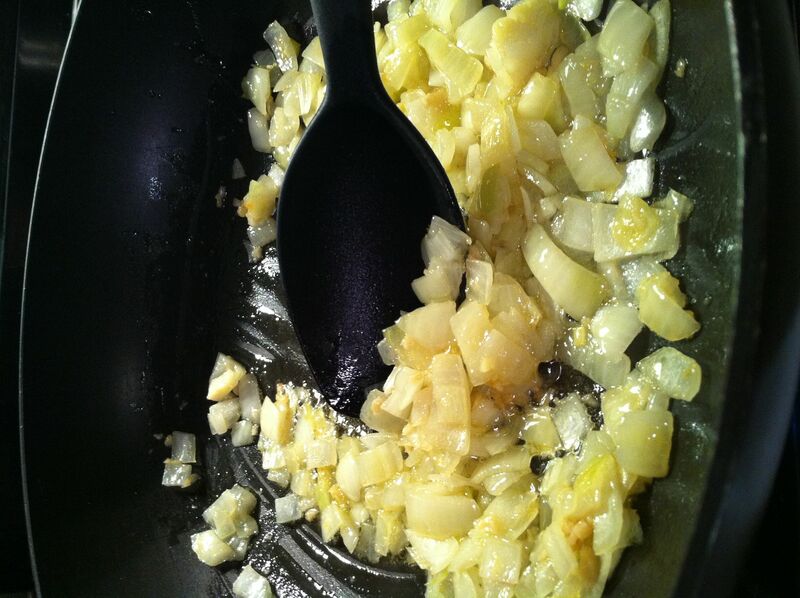 Add the onion and garlic and cook until soft, about 10 minutes. Turn the heat up to medium-high and sprinkle the flour into the pan. 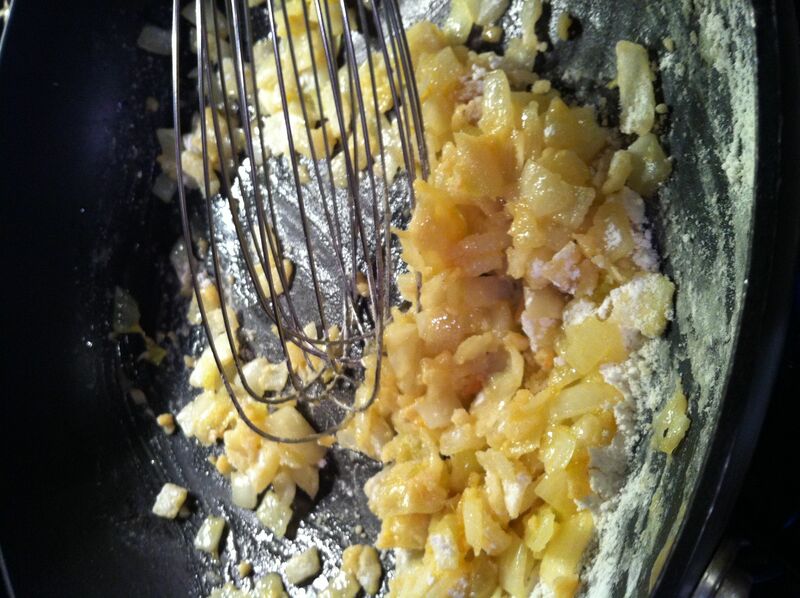 Cook for a minute, then whisk in the wine until the alcohol burns off (about another minute). 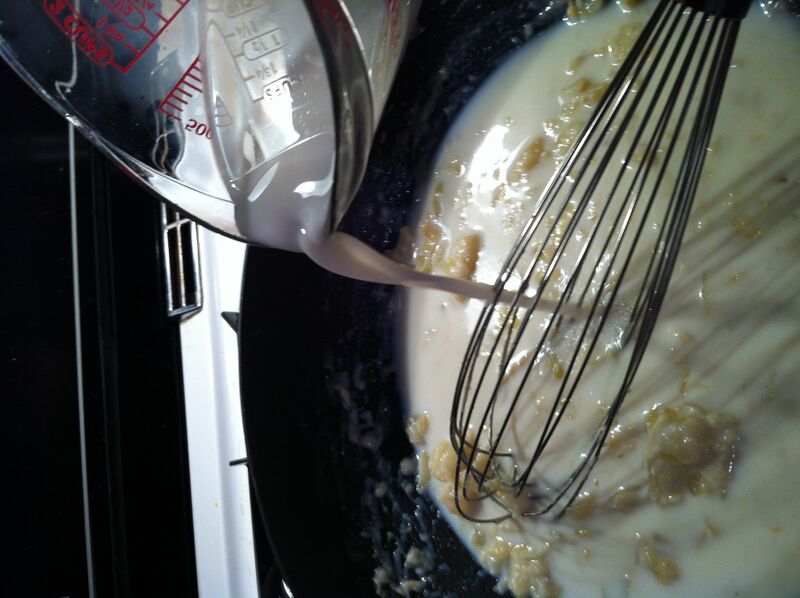 Whisk the milk into the pan and bring to a bubble. Add the nutmeg, spinach, artichokes, salt and pepper. 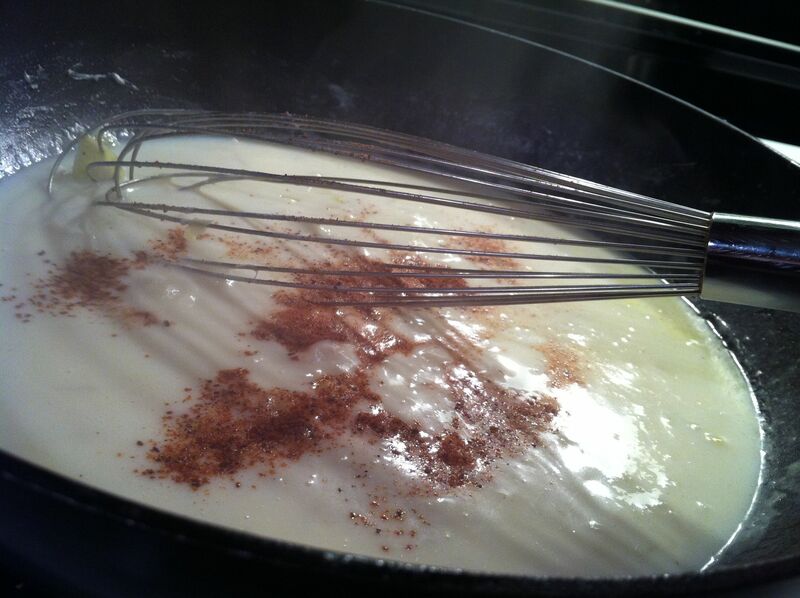 Simmer until thickened and warm, just a few minutes. 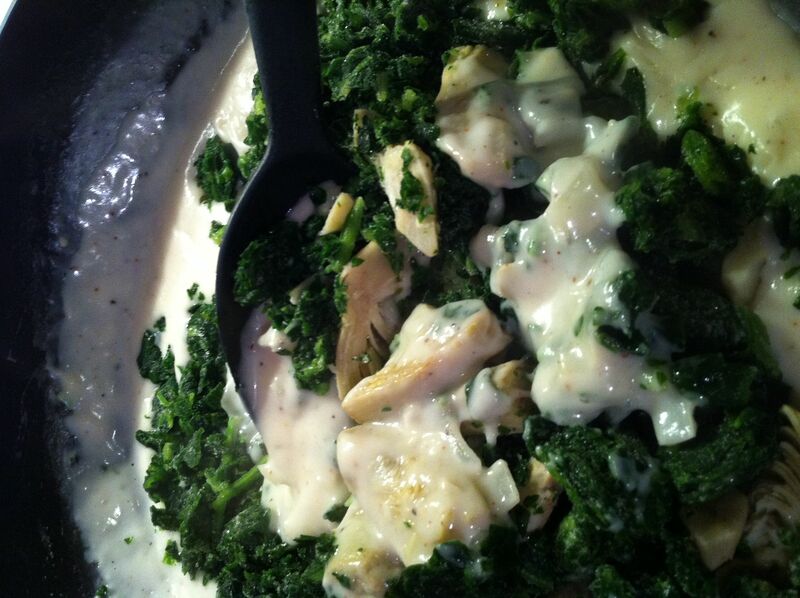 Add a cup of each cheese to the sauce and stir until melted. 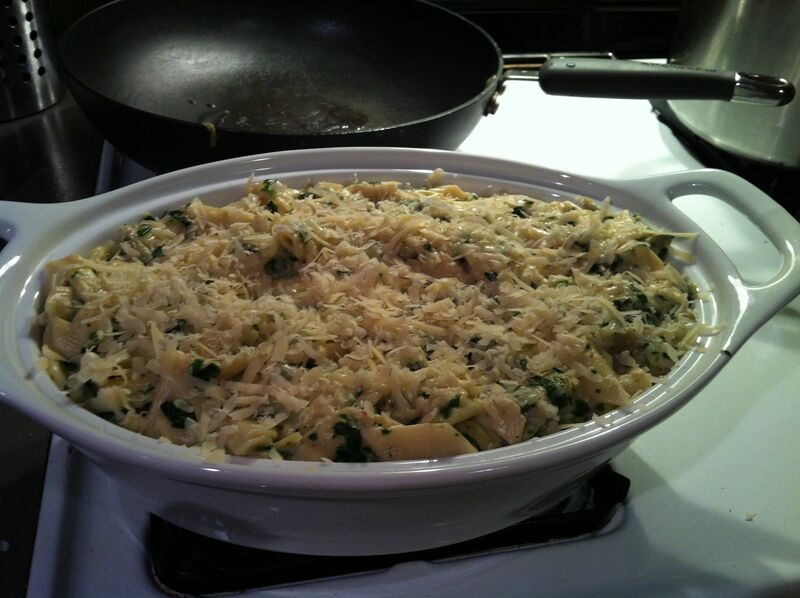 Add the drained pasta to the prepared sauce and transfer to a casserole dish. Add some more of both cheeses on top and bake for half an hour or until the cheese is melted and the top is golden brown. For the fontina, which is a soft, grate-able and very melt-able cheese, you could also try gouda or gruyere, as well as mild provolone. For the whole wheat penne, almost any other type of tubular pasta such a ziti, rigatoni or macaroni would work. A “shaped” pasta, like farfalle, wagon wheels or rotini, would also be fine because they’ll hold on to the sauce well. 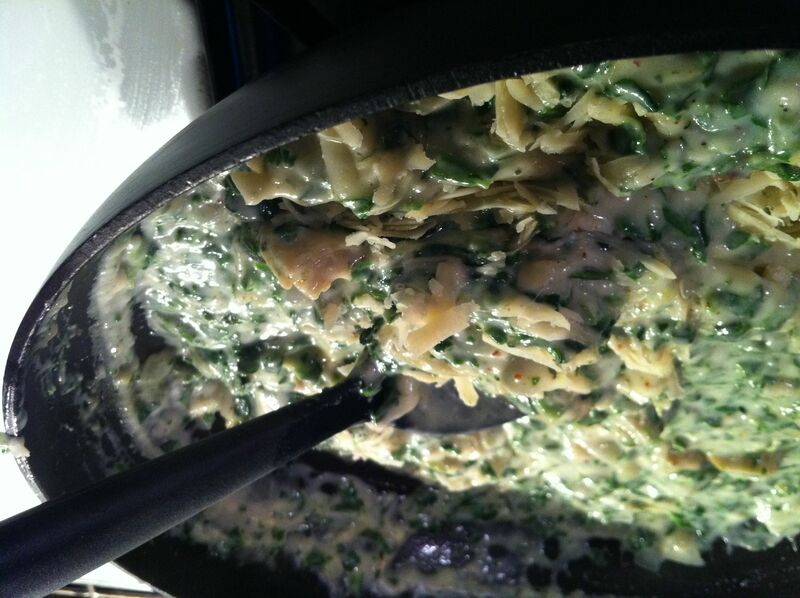 Here’s another recipe for Spinach-Artichoke Mac n’ Cheese that uses sour cream and cream cheese, more like the dip. See which one you like better! 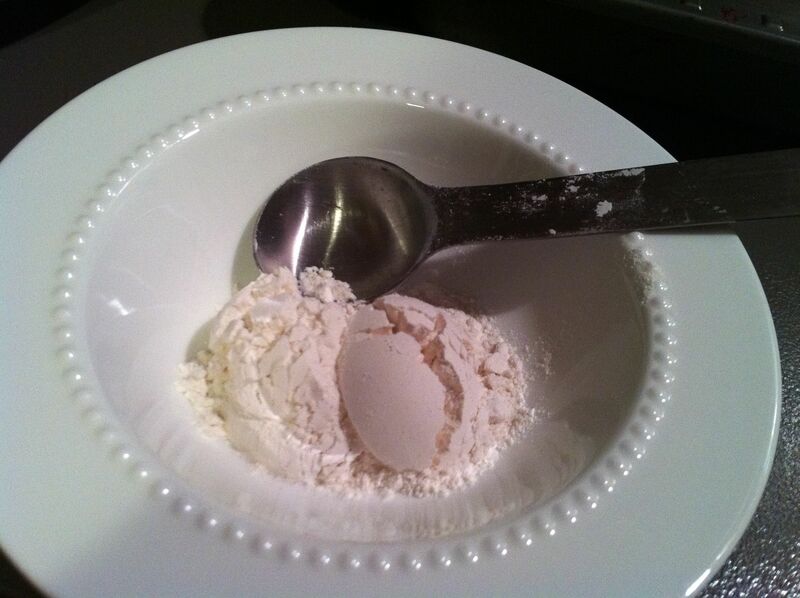 I’m going to try this one as well, just for comparison and to see if there’s any way of improving my usual recipe. 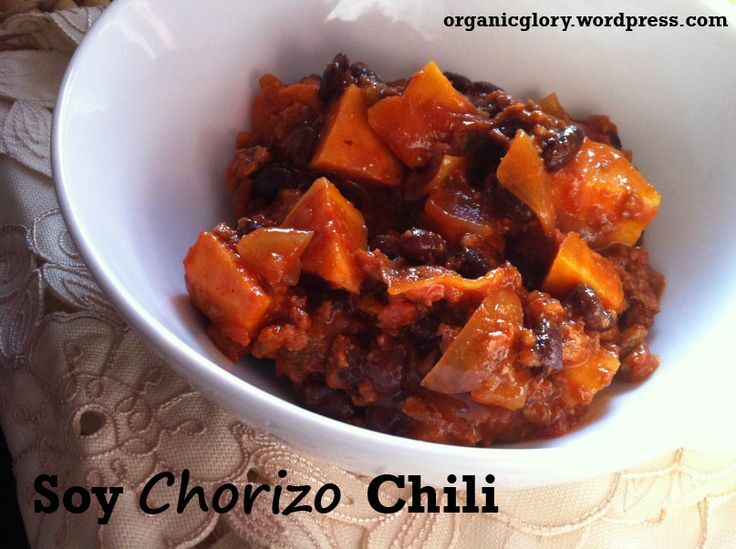 I served these once with rice, sour cream and tortilla chips (healthy, I know…) and then again a couple days later as leftovers with a side salad. Start by preheating the oven to 375. 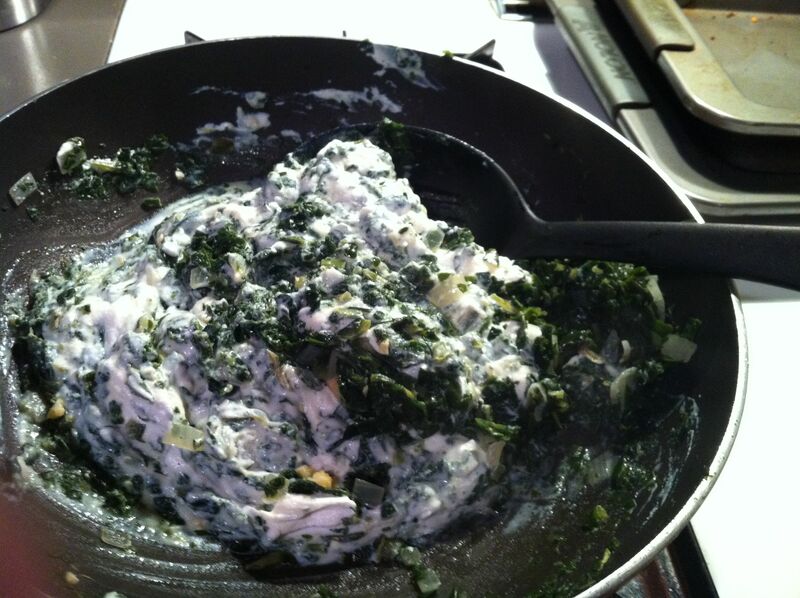 Prepare the spinach (thaw, rinse and squeeze dry), and set aside. Next, melt the butter in a saucepan over medium heat. 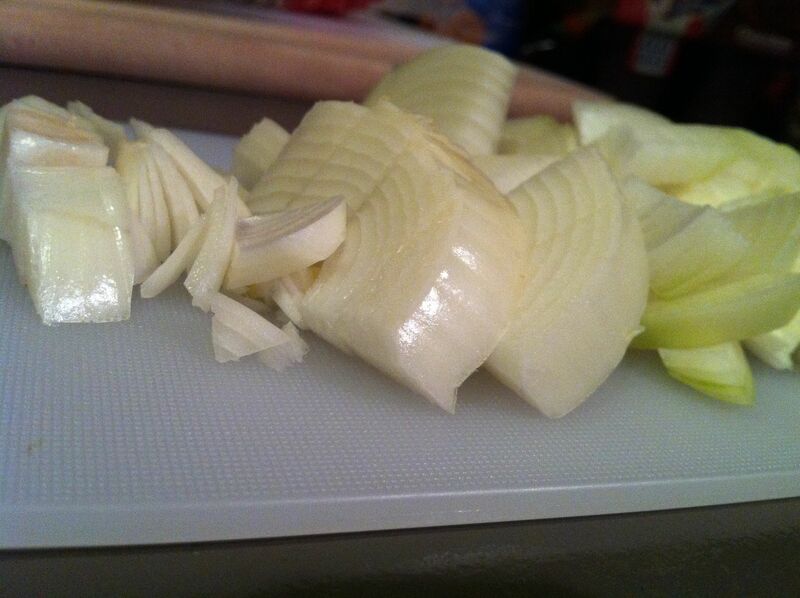 Add the onion and then the garlic (so it doesn’t burn), cooking until fragrant but not browned. 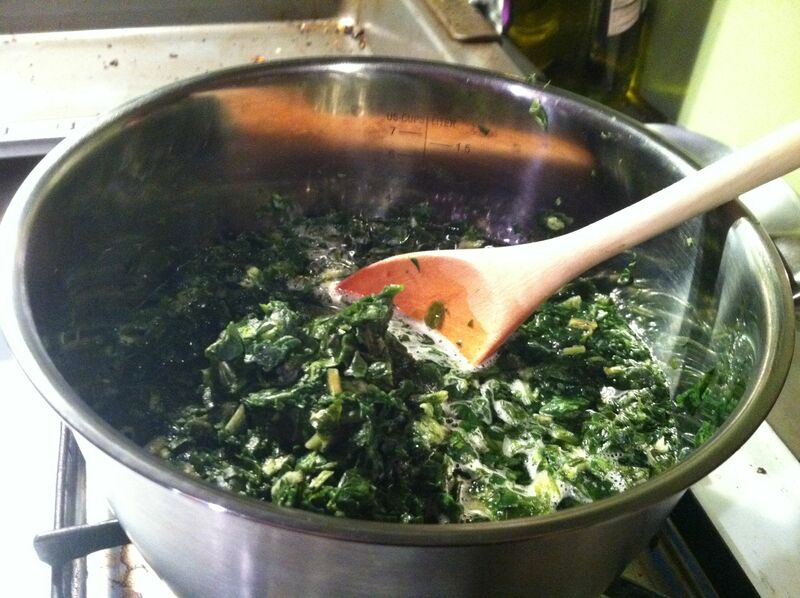 Stir in the spinach. Cook for 5-7 minutes, stirring, then remove from heat. 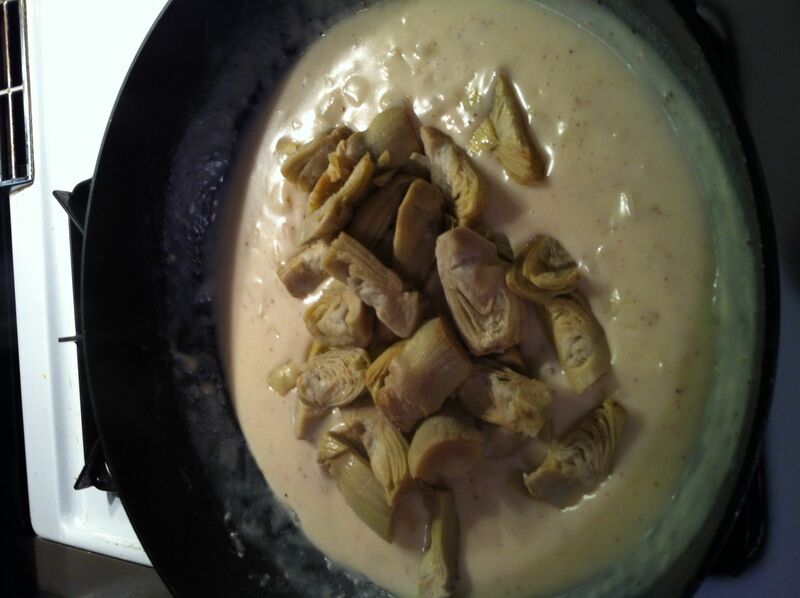 Mix in the ricotta cheese, sour cream, and half the monterey jack cheese. 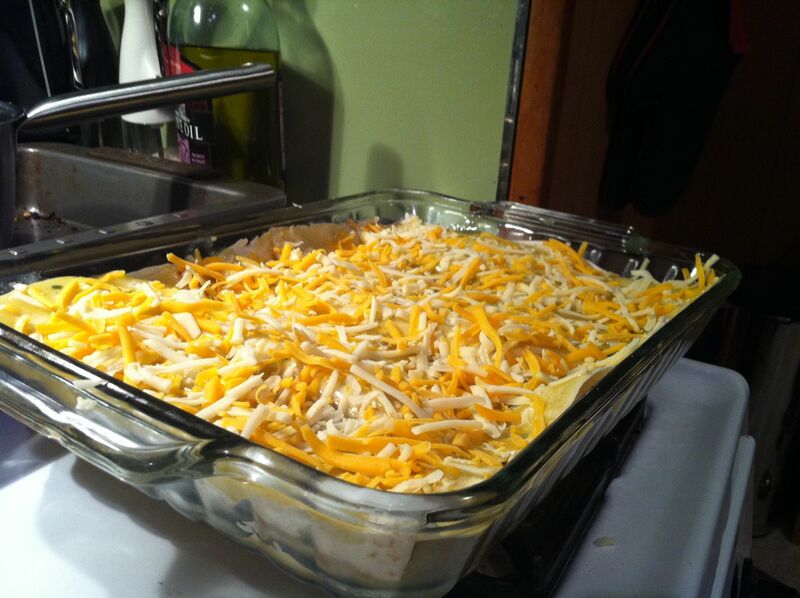 Prepare the bottom of a glass baking dish by pouring about a third of the enchilada sauce in the bottom, making sure you spread it around to coat the bottom of the baking dish evenly. 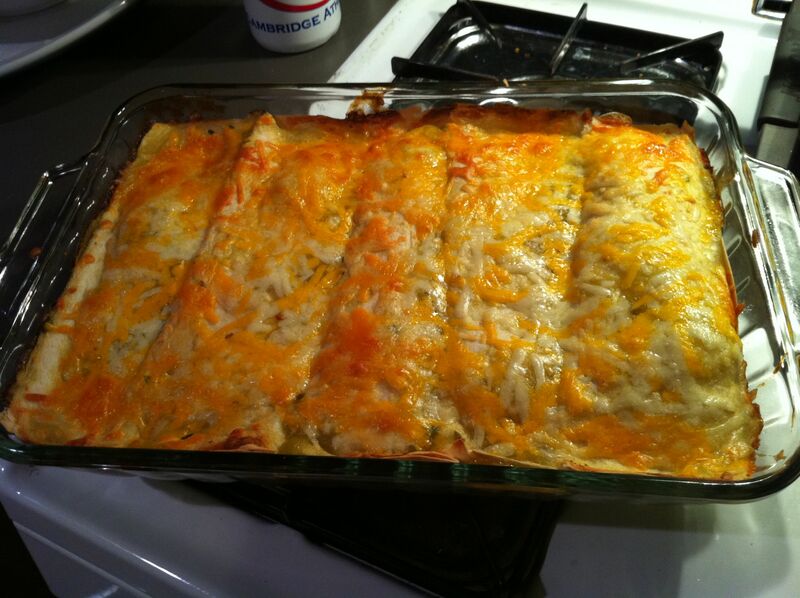 Now, assemble the enchiladas. 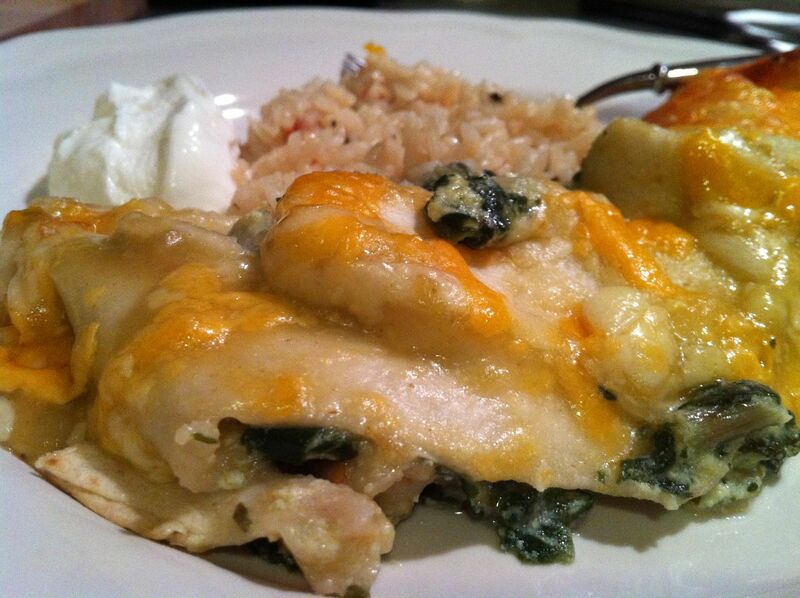 Take a tortilla, spoon some of the warm spinach mixture into the center and fold into thirds, placing the rolled-up enchilada face down in your baking dish. Repeat, laying each enchilada side by side until the dish is filled. 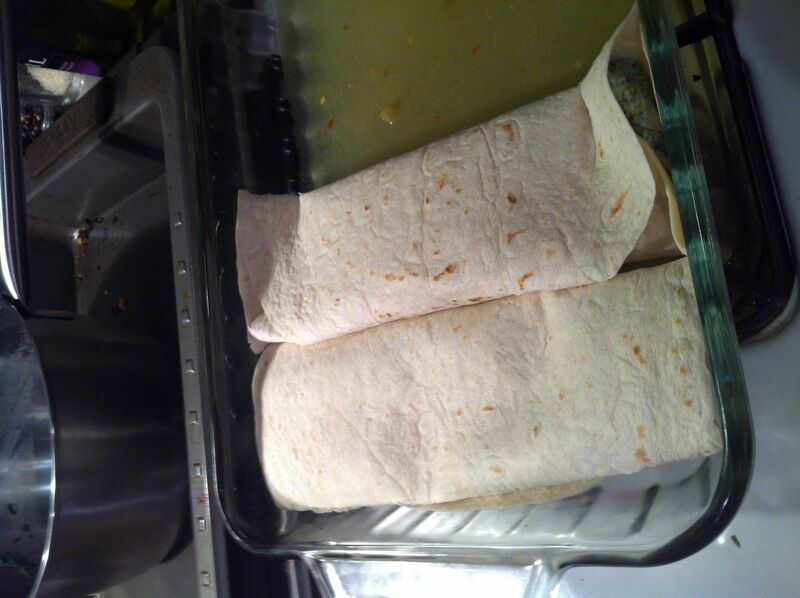 Pour the remaining enchilada sauce on top, spooning it evenly over each tortilla and making sure it gets down in between the seams to nothing sticks while cooking. 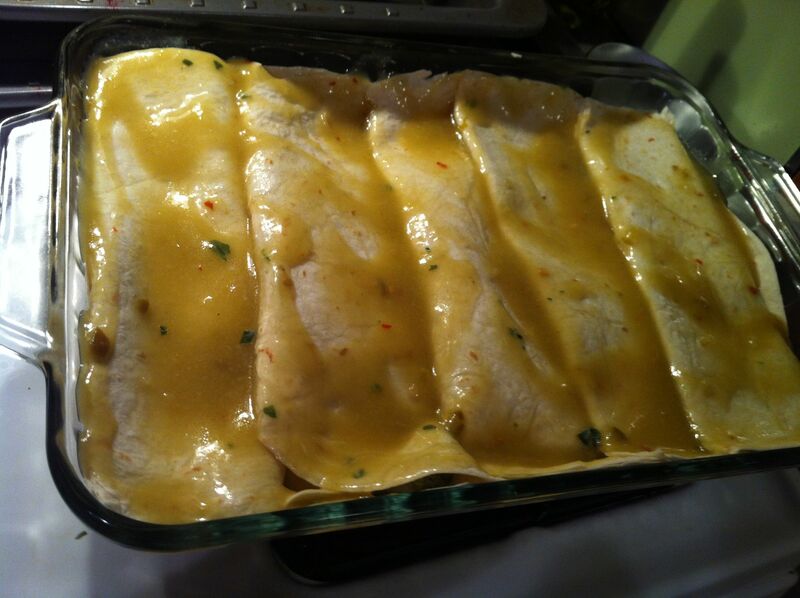 Sprinkle the remaining monterey jack on top of the enchiladas. Bake for 20 minutes or until the cheese is melted and the whole thing looks browned and bubbly. 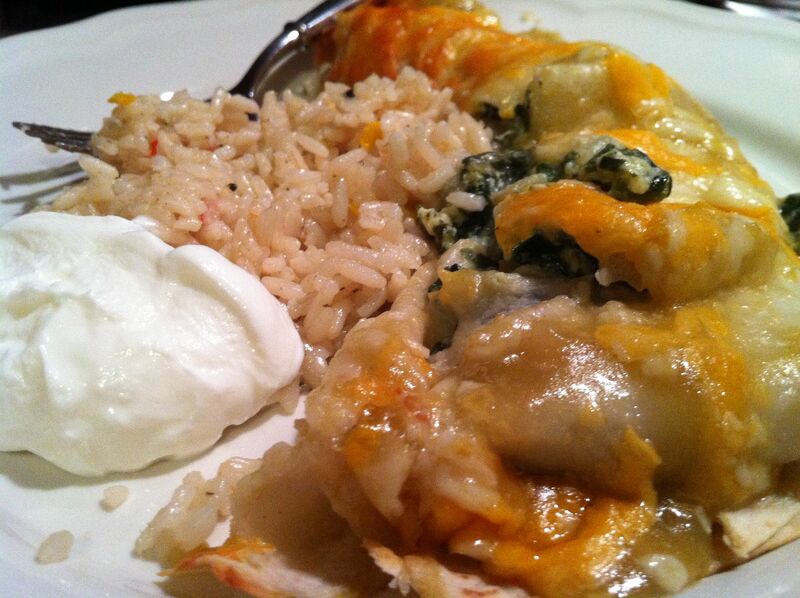 Serve with your choice of sides — sour cream, rice, guacamole, salsa, refried beans, salad, tortilla chips, you name it! 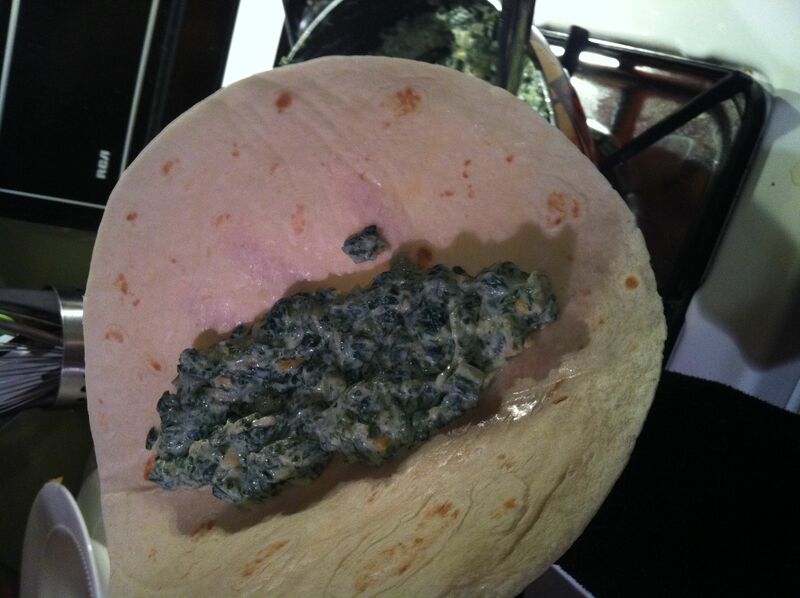 You can also use cooked fresh spinach instead of frozen. I always use low-fat/part skim ricotta and sour cream, and never notice a taste difference. 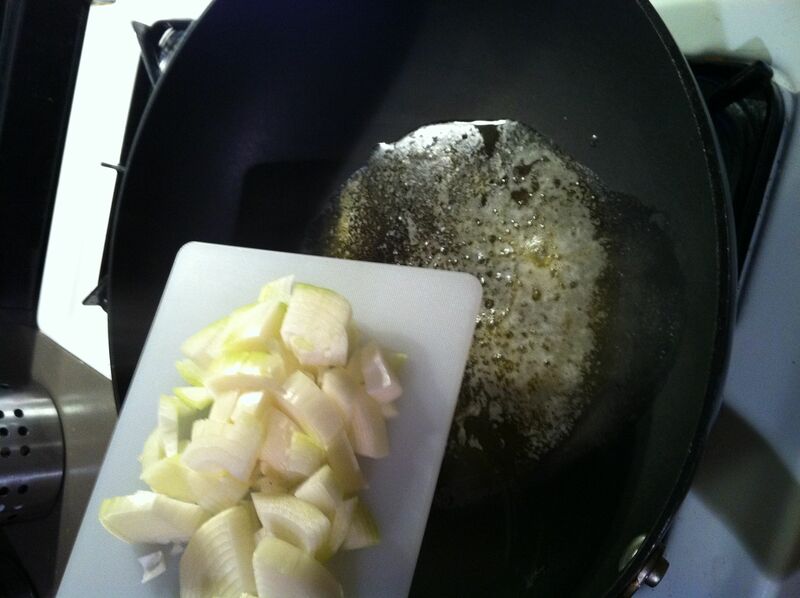 Other ways to cut the fat include sauteeing your onions & garlic in olive oil instead of butter, reducing the overall amount of monterey jack used, and substituting cottage cheese for ricotta. When I make this again, I am going to amp up the heat a little and probably add red bell peppers to the spinach mixture. I really liked the dash of hot sauce I threw in, but I imagine a chopped jalapeno (no seeds) and a can of green chilis would give it even more oomph and flavor. If the filling is too bland, excellent seasonings to consider would be cumin, black pepper, garlic salt, red pepper flakes or chili powder. Red enchilada sauce will work just as well as green here, as will green onions or sweet onions in place of a regular yellow onion. 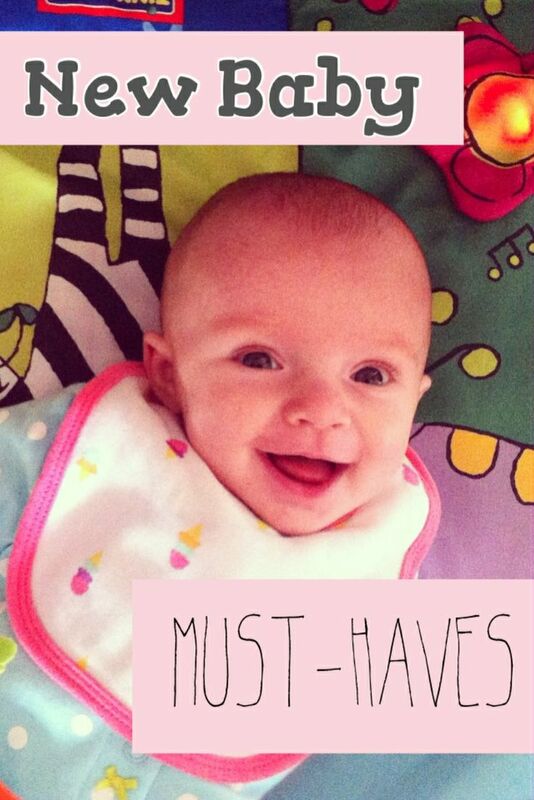 When I saw this on Gojee, I had to re-blog it. For someone who’s not much of a chocoholic, I can readily admit to being a freak about Nutella. And whenever I have chocolate, I prefer it with a kick (ever had the Mexican Chocolate frappe at Toscaninis? 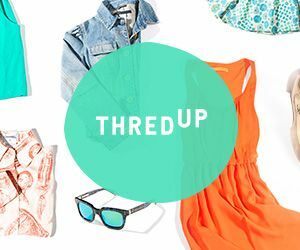 Seriously, check it out). It’s easy to tailor the thickness of your hot chocolate with this recipe, so customize and enjoy! Combine the milk and Nutella in a saucepan over medium-low heat, whisking to combine until Nutella is melted and the milk is piping hot. Add chilli powder or cayenne pepper to taste. Serve immediately! 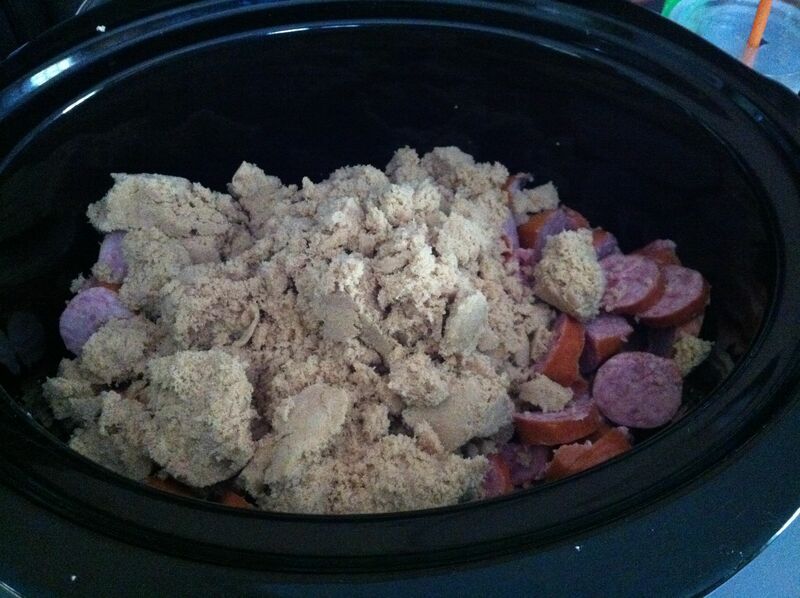 I’m letting you in on my secret go-to potluck dish: Brown Sugar Kielbasa, a crowd pleasing recipe that only has two ingredients and cooks all by itself in the slow cooker while you’re at work. 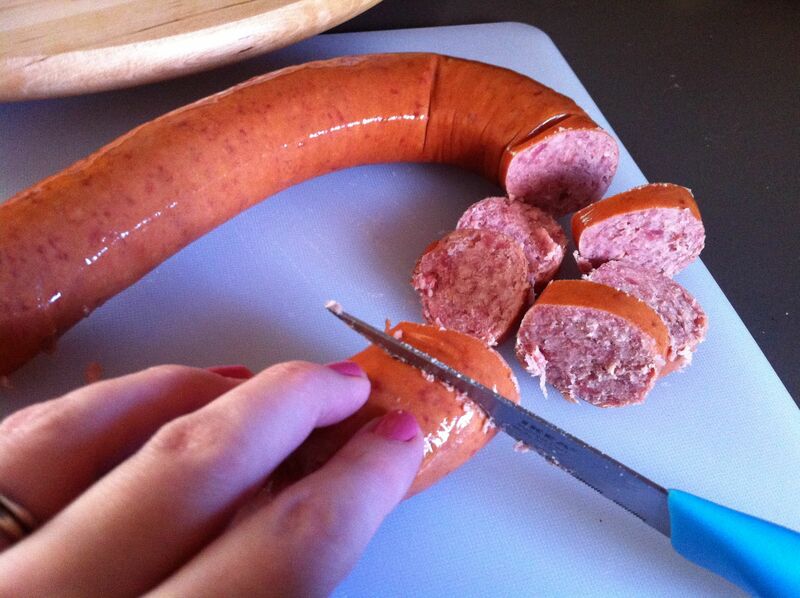 The only downside is that it’s not vegetarian, but it sure does feed a bunch of people with very little effort! 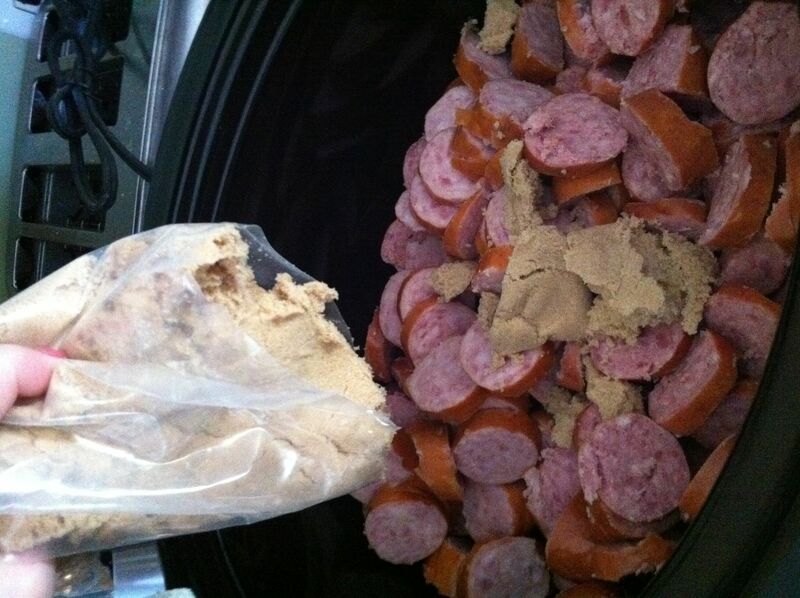 I bring this to every Super Bowl party, baby shower, and potluck around, and everyone always asks for the recipe after. 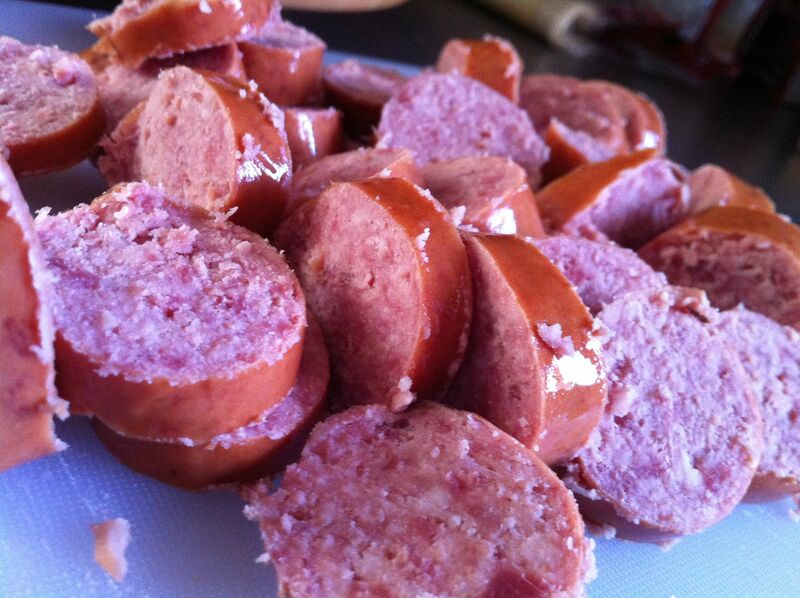 All you need for ingredients is 3 packages kielbasa, any variety — I use turkey, because it’s a little less fatty and greasy — and 1 package (1 lb.) of dark brown sugar (light brown sugar is OK if dark is unavailable). 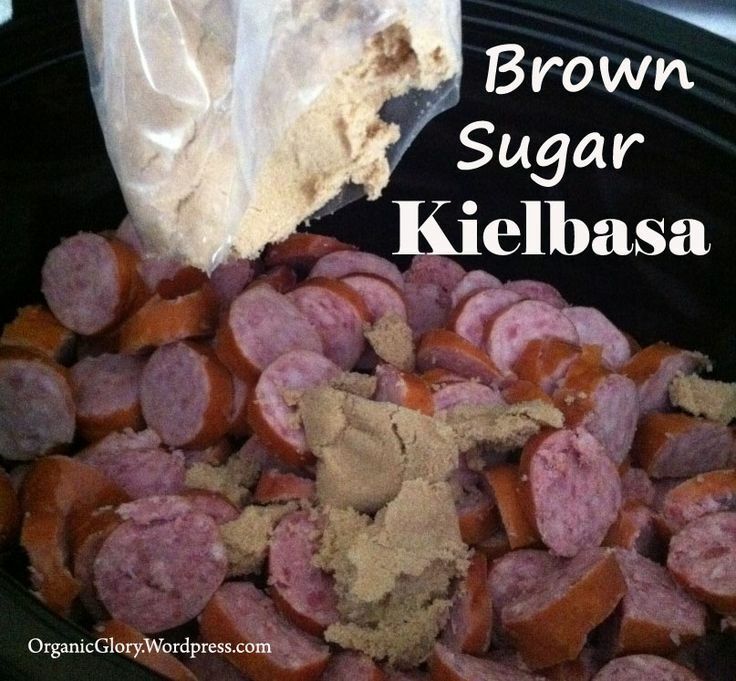 You want a rough ratio of two or three packages kielbasa to one package sugar, but this recipe is flexible enough that you can add or subtract a kielbasa link and it’ll turn out fine. 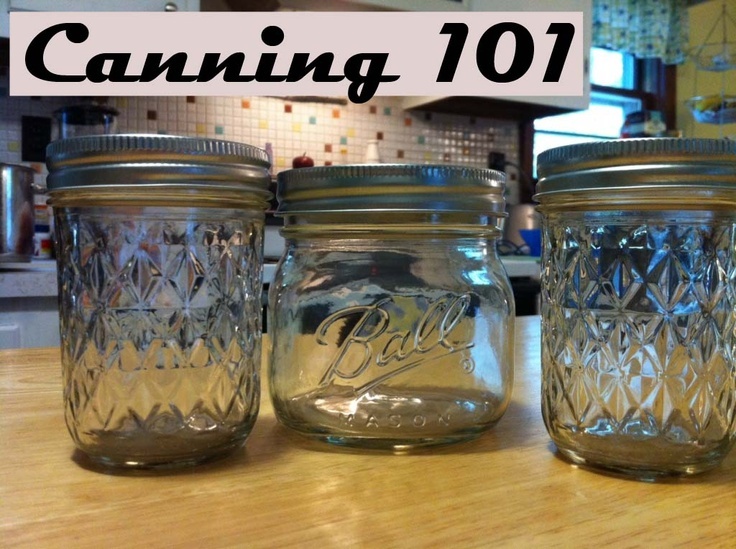 The sugar cooks over either low or high heat until it forms a liquid sauce. 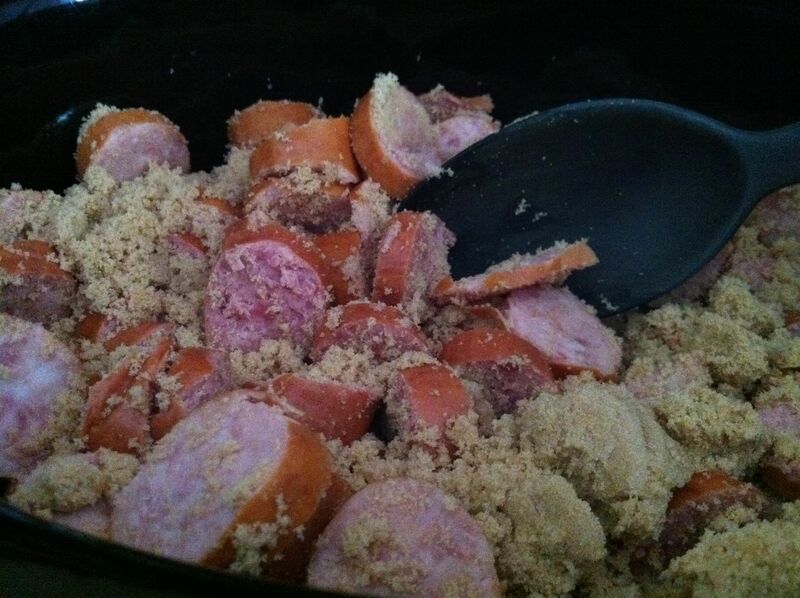 To cook it, slice the kielbasa into quarter-size pieces and place them in the slow cooker, then pour the entire box of sugar on top of the kielbasa, and stir quickly to combine. Cover and cook on low for 5 hours (or on high for 2 1/2 hours). It will look very, very dark when it’s done. And that’s it! Ready to serve warm. 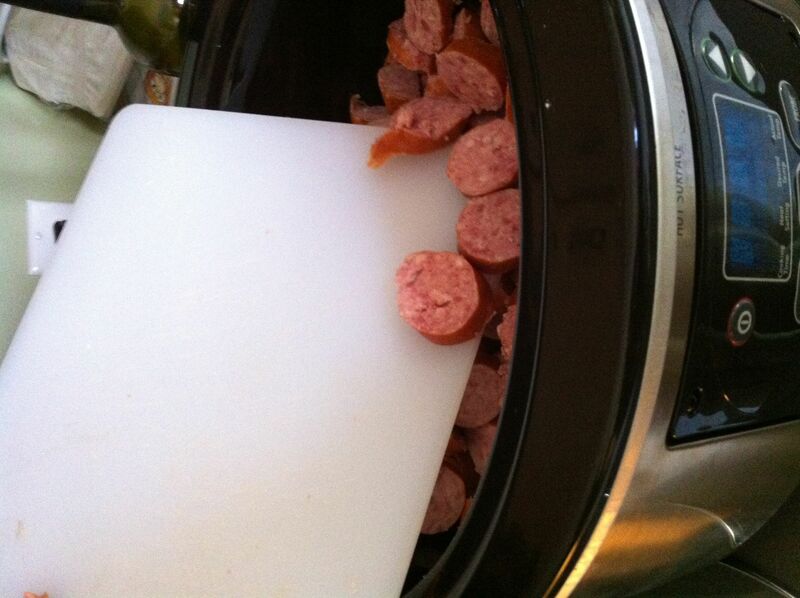 Set it overnight or while you’re at work, and when you get home you can take your slow cooker directly to the potluck or party. You’ll have perfectly cooked kielbasa chunks swimming in a sweet, syrupy brown sugar sauce. Variations work very well with this recipe — mustard, onions, green peppers, fruit preserves, canned fruit, jelly, beans, bacon, garlic and chilli are all great additions here. 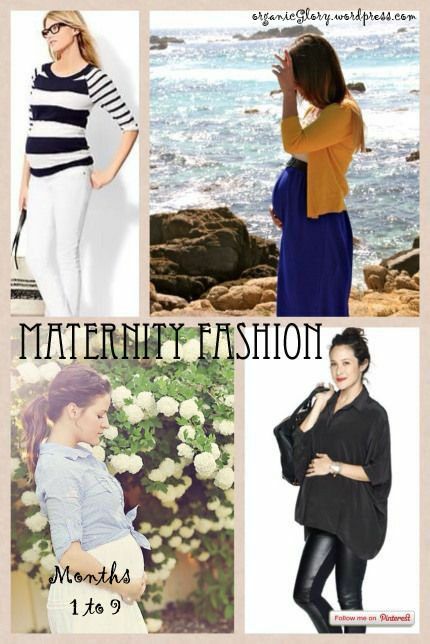 Just read the comments below for even more inspiration! I think my favorite reader suggested change is to add in some ginger beer. How good does that sound? If you make tasty modification, don’t forget to share them!